Gloom Balloon frontman shows off his favorite albums. For any fan of Iowa music, Patrick Tape Fleming should be an instantly recognizable name. If you don’t know him as a founding member of Ames-based rock band The Poison Control Center, you might know him from his enduring musical efforts under the moniker Gloom Balloon or as producer for a number of Iowa artists such as Christopher the Conquered or Twins. Fleming, 37, takes pride not only in his work as a performer but also as a collector of music. Depending on the day you ask him, he would say that he’s been doing one longer than the other. “I’d drive to, like, Sioux Falls after school because there was like no record store or CD store in my town where I grew up. So I’d drive to Worthington, Minnesota, or Sioux Falls, South Dakota,” Fleming says. He must have worked pretty hard since then. His collection of CDs and vinyl records currently adds up to more than 2,000 — a number that even a dedicated collector such as himself has had to tone back on by scrapping most of his CD cases, exchanging them for binders. Fleming usually keeps the art with the discs, though, so not all is lost. 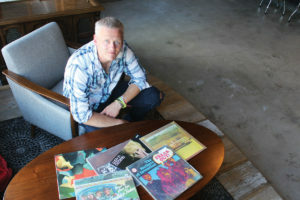 Growing up in the ’80s, Fleming has seen the rise of CDs, MP3s and streaming as prominent ways of consuming music, as well as the resurgence of vinyl in recent years. While Fleming literally has thousands of albums to choose from at any one time, he has a handful of favorites that set themselves apart. “Black Foliage” went on to inspire Fleming in many ways, most notably how it influenced his recorded music. The Poison Control Center would end up backing the Olivia Tremor Control’s Bill Doss at a show, and Fleming was even invited to sing a song with the group when they recognized his super-fan status. When Doss passed away in 2012, Fleming dedicated the second half of Gloom Balloon’s debut album to him. It was titled “Fix the Sunshine (An ode for Bill Doss),” a reference to Doss’ own group The Sunshine Fix. Having a collection as large as Fleming’s would ultimately mean little if the collector wasn’t constantly growing and developing their tastes and skills. Luckily,Fleming has plenty to show for his years of collecting, both physical and spiritual. Let It Be Records is still operating.